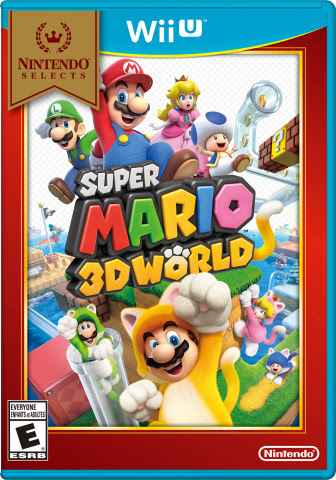 REDMOND, Wash.–(BUSINESS WIRE)– Starting on March 11, some of the most popular and critically acclaimed Wii U and Nintendo 3DS games become a part of the Nintendo Selects program and will be available at a suggested retail price of only $19.99 each. Wii U games like Super Mario 3D World, an imaginative four-player adventure with Mario and friends that received numerous Game of the Year awards and nominations when it first launched in 2013, join Nintendo 3DS standouts such as The Legend of Zelda: Ocarina of Time 3D, one of the most critically acclaimed Nintendo 3DS games of all time. Other Wii U games joining the Nintendo Selects family are Donkey Kong Country: Tropical Freeze, Pikmin 3 and NES Remix Pack. Fun Nintendo 3DS gamesYoshi’s New Island, Donkey Kong Country Returns 3D and Mario Party: Island Tour can also be purchased at the new low suggested retail price of $19.99 each on March 11. Additionally, a group of classics from the Wii console that can be played on Wii U will be available at the reduced Nintendo Selects price. This includes Super Mario Galaxy 2, Animal Crossing: City Folk, Donkey Kong Country Returns and Super Mario All-Stars. For more information about the Nintendo Selects program, visit http://nintendo.com/nintendo-selects. Remember that Wii U and Nintendo 3DS feature parental controls that let adults manage the content their children can access. For more information about this and other features, visit http://www.nintendo.com/wiiu or http://www.nintendo.com/3ds. About Nintendo: The worldwide pioneer in the creation of interactive entertainment, Nintendo Co., Ltd., of Kyoto, Japan, manufactures and markets hardware and software for its Wii U™ and Wii™ home consoles, and Nintendo 3DS™ and Nintendo DS™ families of portable systems. Since 1983, when it launched the Nintendo Entertainment System™, Nintendo has sold more than 4.3 billion video games and more than 692 million hardware units globally, including the current-generation Wii U, Nintendo 3DS and Nintendo 3DS XL, as well as the Game Boy™, Game Boy Advance, Nintendo DS, Nintendo DSi™ and Nintendo DSi XL™, Super NES™, Nintendo 64™, Nintendo GameCube™ and Wii systems. It has also created industry icons that have become well-known, household names such as Mario™, Donkey Kong™, Metroid™, Zelda™ and Pokémon™. A wholly owned subsidiary, Nintendo of America Inc., based in Redmond, Wash., serves as headquarters for Nintendo’s operations in the Western Hemisphere. For more information about Nintendo, please visit the company’s website at http://www.nintendo.com. Justin joined Operation Rainfall to share his passion and knowledge for some of the more obscure video games out there.